All transactions are safe and secure with a reliable history in online purchasing behind each of our associates. 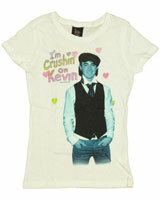 Buy the Kevin Jonas t-shirt to own Jonas Brothers clothing and merchandise. The design on the left features Kevin Jonas, the oldest brother in the band. Kevin has appeared with the band in the Best of Both Worlds Concert 3D movie, Jonas Brothers: The 3D Concert Experience and on several Disney Channel TV shows and movies. Celebrate the elder brother with one of the Kevin Jonas t-shirts on the left that feature Kevin standing with his hands in his pockets. He joined the band after the Columbia Records President heard him sing on one of his brother Nick's songs. In addition to the Kevin Jonas tee above, browse the Jonas Brothers Clothing Gallery for more apparel like men's and women's clothes, kids shirts or hoodies.